References PD_RDFSemanticItem::bindingAsString(), m_desc, m_dtend, m_dtstart, PD_RDFSemanticItem::m_linkingSubject, m_location, PD_RDFSemanticItem::m_name, m_summary, m_uid, PD_RDFSemanticItem::optionalBindingAsString(), and parseTimeString(). References PD_RDFSemanticItem::getExportToFileName(), getExportTypes(), m_desc, m_dtend, m_dtstart, m_location, m_uid, and UT_DEBUGMSG. References XAP_App::getApp(), XAP_App::getLastFocussedFrame(), PD_RDFSemanticItem::importFromDataComplete(), m_desc, m_dtend, m_dtstart, PD_RDFSemanticItem::m_linkingSubject, m_location, PD_RDFSemanticItem::m_name, m_summary, m_uid, StreamToString(), UT_DEBUGMSG, and UT_UNUSED. References m_desc, m_dtend, m_dtstart, m_location, m_summary, m_uid, and toTimeString(). 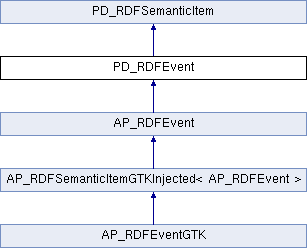 References RDF_SEMANTIC_STYLESHEET_EVENT_NAME, RDF_SEMANTIC_STYLESHEET_EVENT_SUMMARY, RDF_SEMANTIC_STYLESHEET_EVENT_SUMMARY_LOCATION, RDF_SEMANTIC_STYLESHEET_EVENT_SUMMARY_LOCATION_TIMES, and RDF_SEMANTIC_STYLESHEET_EVENT_SUMMARY_TIMES. Referenced by AP_RDFEventGTK::createEditor(), exportToFile(), importFromData(), PD_RDFEvent(), setupStylesheetReplacementMapping(), and AP_RDFEventGTK::updateFromEditorData(). Referenced by AP_RDFEventGTK::createEditor(), importFromData(), PD_RDFEvent(), setupStylesheetReplacementMapping(), and AP_RDFEventGTK::updateFromEditorData(). Referenced by exportToFile(), importFromData(), PD_RDFEvent(), setupStylesheetReplacementMapping(), and AP_RDFEventGTK::updateFromEditorData().